This third volume continues the comprehensive revision of this era, and covers in detail the next fifty years; a very different period during which the Empire came perilously close to total disintegration under the pressure of foreign invasions and seemingly interminable civil war. The economy also collapsed and with it the Imperial coinage, a desperate situation which was only partially alleviated by the currency reform of Aurelian undertaken late in his reign. The complexities of the mint attributes in this chaotic period - lacking as the do in almost instance the name or initial of the responsible mint - have been dealt with in light of recent scholarship. 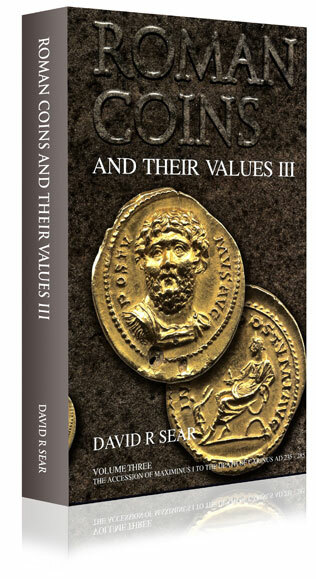 Also included are detailed listings of the Antoninianus coinage not covered in the 'Roman Silver Coins' series. Contains clear black and white photographs and values for VF and EF coins, in both UK sterling and US dollars.